Hilton Amsterdam is a 5 star property located in the Apollolaan District, close to the city's commercial and business community, it offers easy access to some of the most exclusive shopping streets, traditional cafes and famous local attractions such as Van Gogh, Stedelijk and Rijksmuseum to name a few. The amenities featured in each guestroom include individual air-conditioning, LCD television, mini bar, work desk with adjustable lamp, hairdryer and en suite bathroom with separate bath and shower. In-room wired or wireless Internet access is available for a surcharge. The hotel features a restaurant offering classic Italian dishes and the bar serving traditional beer and local specialties. Leisure facilities consist of fitness center, sauna, steam room and whirlpool with extra charge Additional services and facilities include laundry, babysitting, business center, executive lounge and meeting rooms. Amsterdam Schiphol Airport is approximately 15 minute drive from the hotel. The HILTON AMSTERDAM is a Tourist, Business hotel. Located in Oud-Zuid area. Shopping is accessible by bus/taxi and the nightlife/restaurants are located in the hotel. Descriptionclass="small" style="text-align: justify; font-size:11px;">Hilton Amsterdam is a 5 star property located in the Apollolaan District, close to the city's commercial and business community, it offers easy access to some of the most exclusive shopping streets, traditional cafes and famous local attractions such as Van Gogh, Stedelijk and Rijksmuseum to name a few. The amenities featured in each guestroom include individual air-conditioning, LCD television, mini bar, work desk with adjustable lamp, hairdryer and en suite bathroom with separate bath and shower. In-room wired or wireless Internet access is available for a surcharge. The hotel features a restaurant offering classic Italian dishes and the bar serving traditional beer and local specialties. Leisure facilities consist of fitness center, sauna, steam room and whirlpool with extra charge Additional services and facilities include laundry, babysitting, business center, executive lounge and meeting rooms. Amsterdam Schiphol Airport is approximately 15 minute drive from the hotel. Located on a canal with its own boat dock, this hotel is charming. The restaurant is a bit pricey, but staff was super friendly and helpful. Our room was quite large for a European hotel. It wasnt too far from major museums and a bit further to the heart of Amsterdam major canals. Thank you for leaving a 5 star review here on TripAdvisor. We really appreciate your opinion and we are happy to read that you enjoyed your stay at Hilton Amsterdam. Your kind compliments about our Team Members, who always go above and beyond to deliver the best service possible, have been shared within the whole Team. Indeed, our hotel is located in one of the most luxurious parts of Amsterdam and is close to the famous city landmarks. We look forward to welcome you back at our hotel in the near future. Located in a quite area of Amsterdam away from the tourist hords, the Hilton Amsterdam is but a single Tram ride (line 24, â‚¬8/24 hours) from the central train station or to the museum district (line 5). I like the location because it is also a short a pleasant walk to the convention center (about 1.5 miles). On top of location, the rooms are clean, the staff helpful and friendly, the breakfast very good and the convention center top-notch. Next time Iâ€™m back, Iâ€™ll stay again. I have had the worst experience in staying with Hilton Amsterdam. I was told I would have an early check-in. I got here at 1:30 PM and my room was not ready. The Front desk told me it would be ready by 3 oâ€™clock. I happily waited. They went back at 3 oâ€™clock on the dot. Still not ready waited an additional 25 minutes and was told it would be ready when theyâ€™re done cleaning it. Another 30 minutes go by and it is still not ready. After showing my dissatisfaction the front desk lady gave me two twin beds and told me to push them together to make one king size bed. Tired from traveling I took out without saying anything, still dissatisfied. I called the concierge to have them bring up my luggage. It has been 40 minutes and I have called twice. It is still not to my room. Thank you very much for choosing to stay with us at Hilton Amsterdam and sharing your experience here on TripAdvisor. I deeply regret to read about your arrival experience, please rest assured that this is not at all representative of our high service standards. For the shortfall in service you experienced, I offer my sincere apologies. Your valuable comments have been shared with our Front Desk and Concierge team for immediate improvement of our services and to avoid re-occurrence in the future. As your satisfaction is of the utmost importance to us, our team will reach out to you via private email to follow-up on this matter with you personally. We hope to welcome you back to our hotel in the near future to show you we can do better. Nice hotel in upperscale neighbourhood. Hotel lies out of the city center in a quiet setting opposite a small river. In front there is a large park area which is secured and paying. Huge lobby with reception area with sufficiÃ«nt staff ,so there is no queue. Some of the staff say they do not speak Dutch which seems a little bit strange,so we continued in English.Checkin was fast (already done online) and keys were geven. Luggage was brought by another member and room was shown. Junior suite was big overlooking surroundings and river,with Panoramic Windows. Room seems to be renovated. bathroom was with combi bath -shower. Rooms were very soundproof,no noise from outside. Breakfast was or in executive lounge or in restaurant ground Floor. Friendly and attentive staff in restaurant assuring calm athmosphere. SufficiÃ«nt choice of warm and cold dishes. The bar had a very nice terrace in front of the river , there is also a garden with sunloungers. 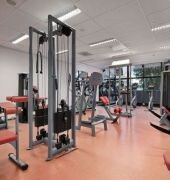 The city center is only 15 min away by tram ( line 2 stop Emmastraat) 200 m from hotel. Overall nice hotel in a quiet and safe neighbourhood ,easily reachable by car. Not to forget : Good Italian restaurant. So When in Amsterdam : i come back! Thank you for leaving a 5 star review here on TripAdvisor. We really appreciate your opinion and we are happy to read that you enjoyed your stay at Hilton Amsterdam and experienced Italian cuisine in our Roberto's Restaurant. Your kind compliments about our Team Members, who always go above and beyond to deliver the best service possible, have been shared within the whole Team. Indeed, our hotel is located in one of the most luxurious parts of Amsterdam and is close to the famous city landmarks. Located in a quiet area away from downtown. Canal in the back. Tram service is 8 mins walk. Takes about 30 mins to get to cental station. Had a king deluxe room. Has a sofa and large HDTV but no chair. Complained to front desk that the there was no air conditioning. Was told that they will check. Came back later and it was the same and another front desk receptionist checked and sent an engineer up to the room who explained that they used a central air conditioning system which was not set to a cold temperature in winter. So even though outside temps were in the 59sF, the room was at 75F. Opening the window helped a few degrees but can be noisy. The front desk apologized but problem not remedied. Have encountered this problem before in a Hilton property in Dublin. The breakfast buffet is ordinary with the usual assortment of breads, yogurt, drinks, cheese, bacon and scrambled and boiled eggs. No cook to order eggs. Much better and sumptuous breakfast buffet at DoubleTree central station. The executive lounge is on the top floor or roof of the hotel. Nice view of the surrounding area but not allowed to go outside. Array of snacks, water, coffee, wine, beer and whiskey each evening. Thank you for leaving a review here on TripAdvisor. We really appreciate your opinion about your stay at Hilton Amsterdam. Please rest assured that your comments will be discussed to avoid reoccurrence in the future. You may always contact me directly via: AMSHI_operations@hilton.com if you still have any remarks or questions. We hope welcome you back with us.